A group of activists came to One Government Center at 10:30 a.m. today to support an initiative that — if approved for the ballot by the Lucas County Board of Elections and passed by voters in November — would loosen the City of Toledo’‍s marijuana law. The proposal, known as the Sensible Marihuana Ordinance, would decrease the penalties for marijuana possession. Supporters argue that the changes are needed because they believe the city’‍s current law comes down too harshly on nonviolent offenders and patients using marijuana for medical reasons. “Today is a historic day — not just for Toledo, but for the nation,” said activist and former City Council candidate Sean Nestor, who briefly addressed about a dozen supporters outside One Government Center. 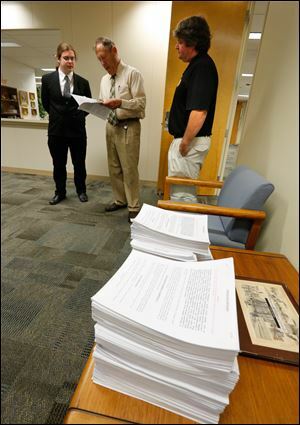 He and five other supporters of the ordinance then entered the building to ceremoniously deliver petitions with about 13,000 signatures; 6,000 valid signatures are needed to get the issue on the ballot. Wednesday is the deadline to submit petitions for issues for the fall ballot. The spelling of the proposed ordinance uses an “h” because of the spelling of the city‘‍s existing legislation. Supporters included Anita Rios, the Green Party candidate for Ohio governor. Many were members of the northwest Ohio chapter of NORML — the National Organization for the Reform of Marijuana Laws — the local group spearheading the initiative. 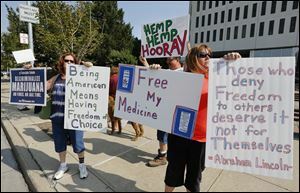 Outside the building, some supporters held signs with slogans such as “Hemp, Hemp, Hooray” and “Freedom of Choice: A Sacred American Right.” Others wore NORML shirts and other marijuana-themed apparel. A dog clad in a wreath of fake plastic pot leaves was also present. Contact Marissa Medansky at: [email protected] or 419-724-6368.